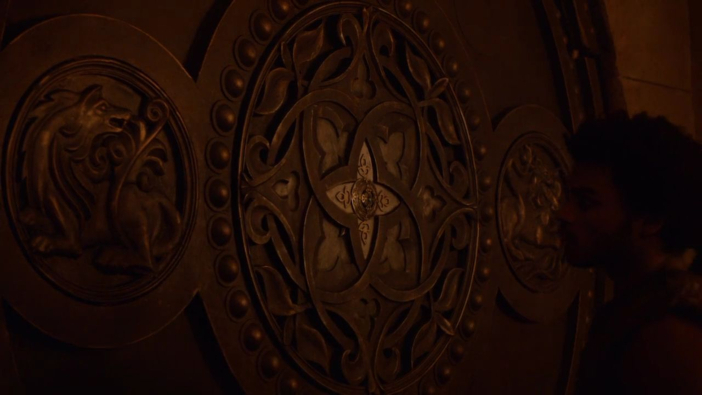 This may seem inconsequential to the immediate plot and story of Game of Thrones, but I was wondering if there is ANY significance to the vault in Qarth having a Valyrian Stone door? Is there any history explaining how the door came to be be? The immediate significance of the door is simply that it is next to impossible to break into and the material itself is extremely strong as Xaro himself explains in the scene where the door is revealed. Xaro: The door and the vault is made of Valyrian stone. The hardest steel does not make a mark. I offered the greatest locksmiths in Qarth their weight in gold if they could break into it. I made the same offer to the greatest thieves. They all went home empty-handed. The only thing that can open this door is this key. Game of Thrones, Season 2 Episode 5, "The Ghost of Harrenhal"
If you're looking for any further significance or history of the material or door than that then I'm afraid you're out of luck. The only information we get on it in the show is that small paragraph by Xaro. That said in the books there is the material called dragonstone which is probably what Valyrian Stone in the show is meant to be. The heart of Old Volantis is the city-withinthe-city—an immense labyrinth of ancient palaces, courtyards, towers, temples, cloisters, bridges, and cellars, all contained within the great oval of the Black Walls raised by the Freehold of Valyria in the first flush of its youthful expansion. Two hundred feet tall, and so thick that six four-horse chariots can race along their battlements side by side (as they do each year to celebrate the founding of the city), these seamless walls of fused black dragonstone, harder than steel or diamond, stand in mute testimony to Volantis's origins as a military outpost. This material is used within many of the Valyrian's buildings and is extremely strong and made of fused stone. It is said it is created through the use of magic. Why do these five powerful houses not possess Valyrian Steel Swords? Does Joffrey ever show incestuous tendencies? Why were there so many willing accomplices to the Red Wedding? Who planned or ordered to kill Bran?